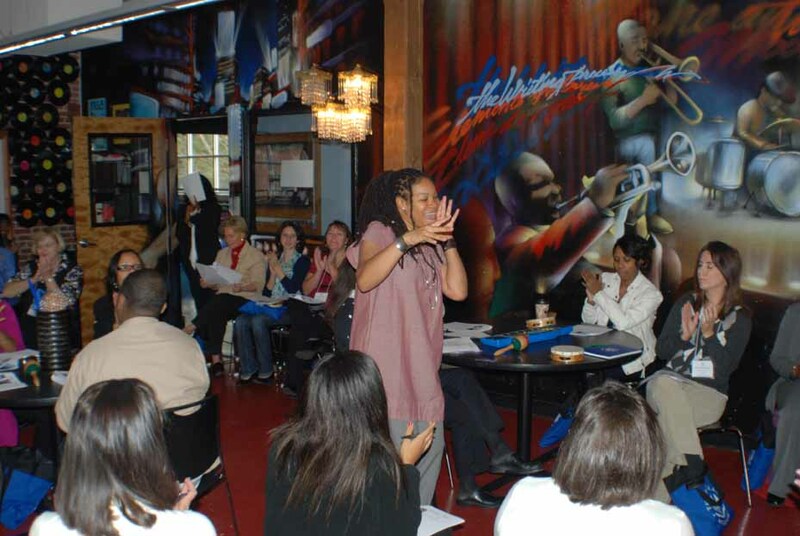 Susan Arauz Barnes, language arts and reading teacher at Ron Clark Academy, includes in curriculum lessons on blues writing, including cultural history of the blues. BARNES’ LOUNGE, Ron Clark Academy, South Atlanta, Georgia — The writing process takes place in Barnes’ Lounge at the Ron Clark Academy — today it is writing the blues — and those receiving the lesson from language arts and reading teacher Susan Arauz Barnes are educators from across the nation. Scores of educators have come to South Atlanta to attend the National Educators Conference. Visitors to Barnes’ Lounge are greeted by an urban façade of graffiti, tagging in light blue, white, red and black spray paint. Perhaps this is Harlem? Seemingly, it could be in countless places across America. Inside the lounge the décor is decidedly bluesy. There is a mural of a woman singer fronting a four-piece band. The players include slide trombonist, trumpeter, upright bassist and drummer, sitting amongst a full set. Albums, when music was pressed onto black vinyl with distinctive logo labels and sometimes called platters, decorate the red-brick wall. There is even a framed copy of the iconic “A Great Day in Harlem” portrait of 57 prominent jazz musicians shot by Art Kane on August 12, 1958 in front of a brownstone in Harlem, New York City. As visitors file in, they are handed a “Writing the Blues” course syllabus and take seats at round tables like you’d find in your everyday lounge, substituting, of course, for classroom desks. Among those in the class are eight from the Murfreesboro City Schools (Tennessee), who would later call themselves the Steelers and write a blues song as part of the class assignment. Several educators are here from Guilford County Schools (GCS) of Greensboro, North Carolina, which serves 72,500 students in 124 schools in urban, suburban and rural areas. GCS students speak 123 languages from approximately 100 countries. “I’m Mrs. Barnes and you are about to write the blues,” the language arts and reading teacher sings into a hand-held microphone, finger popping with a thumping bass line from electric bass guitar, as a matter of introduction. “Let me try that again,” she says, cajoling the group to perk up. “You are about to write the blues. We have to warm them up because they are not ready. We have to pretend that we didn’t come home from the other night. Barnes prances around the classroom floor, singing what she would later teach is the AAB pattern of a blues song. The poetic formulation consists of a line sung over the first four bars; it is repeated over the next four bars and then a longer concluding line over the last bars. The third line ends in rhyme with the first two lines. The way Barnes sings it so succinctly successfully blue writing is just a matter of learning and then adhering to the pattern. Next she gets the classroom to clap along in time to a walking bass played by her accompanist, Gina Riggins, a middle school reading teacher in Greater Atlanta’s Fulton County schools. Riggins is also owner of Creative Arts Institute, where beginners receive music lessons and literacy enrichment. Riggins is a skilled musician on clarinet, trombone, “djembe” and, of course, electric bass guitar. Some in the audience are already familiar with the byproduct of rhythm and words is the call-and-response medium. “Good morning, Mr. Blues, I wonder what you are doing here so soon,” the teacher sings the AAB pattern. “I said, Good morning, Mr. Blues, I wonder what you are doing here so soon. The actual experience that led to developing a blues curriculum occurred while Barnes was a teacher in Brooklyn, New York. “The idea came when I was teaching in Brooklyn,” she says. “It was 1999. Let us bow our heads and have a moment of silence for the Class of ’99. Those kids walked into the room already mad. I’m like, ‘It’s homeroom, good morning.’ They walked in already angry and I realized, ‘Hold on, I am the languages arts teacher. If anyone is going to help them shape what is going on, help them give voice to what they are experiencing, it’s me. I have to find a way to get them to write it and speak it. In a matter of minutes, amid laugher and demonstrating that learning can also be fun, the educators pick up on the beat and the three-line formula. Then Barnes sequences into a history lesson about the blues written into the curriculum. Barnes taught language arts, creative writing, and literacy in Harem and Brooklyn from 1996 to 2008 before relocating to Atlanta. “The blues, you need to understand, comes out of an oral tradition,” Barnes says. “It is a unique American music. It came out of the fields, where slaves brought African influences, where they actually used music to keep things humming in rhythm. That line repeated is the call and response. Before groups are let go to write an original blues, Barnes teaches how Langston Hughes used the blues form in the poem “Wide River,” which is included in “The Dream Keeper and Other Poems,” first published in 1932. Together, they sing “Wide River” in the same way that blues is used across the curriculum — social studies, science, mathematics and vocabulary — here at Ron Clark Academy. Barnes’ Lounge is now filled with laughter and chatter as the educators are in groups writing their own original blues. Two lucky groups will be picked to sing their creations on The Next Stage. The Steelers, a group from Murfreesboro sang a blues about pay being a joke and at Christmastime being broke. Ronald Dixon, assistant principal at Guilford Middle School in Greensboro, and his colleagues also were picked to perform their blues song. “It was a great learning experience for everyone,” says Faye Nobles, library media specialist at Walter Hill School in Murfreesboro, Tennessee. 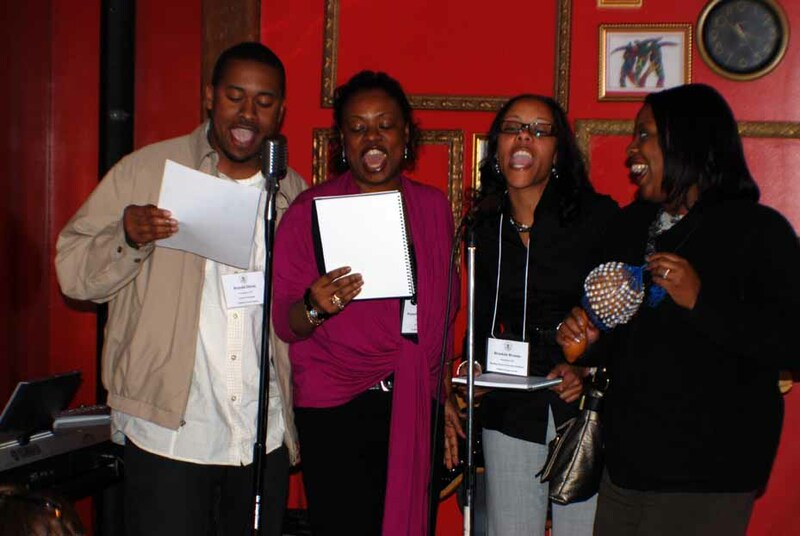 Ronald, Pamela, Brooksie and their colleague in Guilford County Schools of Greensboro, North Carolina perform an original blues composition in Barnes' Lounge.